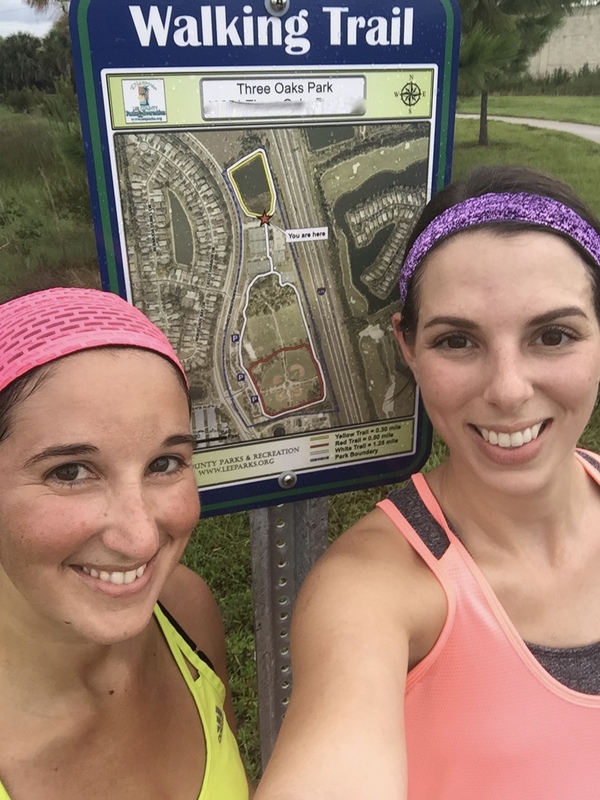 This is such a great example of how fellow runners and bloggers really inspire each other! My speed work consists of 400s, 800s, and bridge repeats. Once in awhile I'll throw in a tempo run, but I have avoided 1600 repeats because they freak me out. The idea of holding a really fast pace for a full mile again and again is just daunting! But Tuesday was gray and drizzly, and I had that blog post and my comment bouncing around in my head, and I just decided that's it. I know I can hold a good, fast pace in a 5k because I did it not too long ago, so why do 1600s scare me so much? I decided to finally try them out. I told Elizabeth we'd aim for a 9:00 pace; I wanted to be conservative because I had no idea what to expect. I was thrilled with the outcome! They weren't the fastest - in fact, they felt a little easy and I know now that I could have pushed harder; I never know what my limit is going to be when I try new speed work - but I felt so strong for conquering my fear and trying a new workout! Next time I'll aim for a more consistent <8:40 pace the entire time. Of course, now this means we'll have to repeat it at some point; I've opened a can of worms. But I was reminded of how invincible a good, successful, challenging workout can make you feel! Also, our park added a sign demarcating it various routes and their distances, which is a nice little addition! The breezy, rainy weather definitely helped, but I'm feeling a little better every day about crushing this 10k no matter the weather. My body just feels stronger and more capable than it has in a long time, and I'm excited to see my hard work pay off. Hopefully it pays off in the long run for longer distances, too. Tell me about a workout you crushed that raised your spirits! What's your favorite distance for repeats? Who has inspired you lately? My favorite has been a ladder workout: 400, 800, 1200, 1600, 1200, 800, 400. It's challenging and awesome! Way to go! Sounds like a really tough but effective workout. 800 m repeats is probably my favorite distance in paddleboard training. It's long enough that it's not sprinting, but it's short enough that I can go a bit faster than my race pace and hold good form... so I feel like I'm paddling the way I eventually want to be paddling in races. Matt has inspired me lately because he's so consistent rain or shine. How awesome! you totally rocked that speed work! The last work out that I was proud of, and helped me beat a PR was back in March, a progression 9 miler. It was a week before a Half marathon, and it helped me so much mentally! Of course I read a post earlier today on 1600's that Lora wrote and Helly's post the other day, now yours....it must be fate that you guys all pump me up. I have 6x1600 tonight w/ 400 recovery between both. I will have a total of 10.5 miles in once the workout is complete. Even though I have done mile repeats before and ran 6x1200 a week ago, that extra 400m is scary territory. Holding that pace is scary, worrying about not being able to finish the workout in an "acceptable" time frame is scary. The 3 of you couldn't have had better timing on these posts! You never know until you try! Good for you for finally giving this a go! How long was your recovery in between? Feels good to mix things up once in a while. Looks like this was a big confidence booster too! Nice job! Love the quote, and you both are awesome!!! WAY TO GO! That's awesome!!! I had a very similar experience the first time I had to do 12 x 800s. 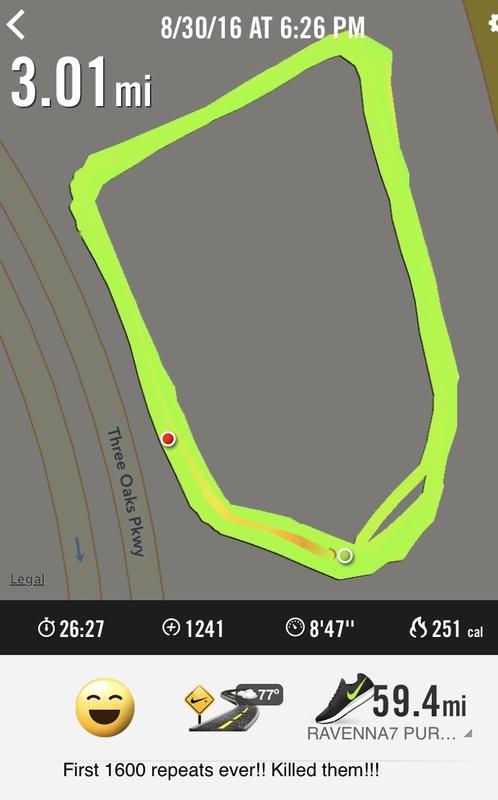 I was extremely intimidated by doing TWELVE of them so instead of doing them all at goal pace, I worked my way up to goal pace by subtracting 10 seconds for each new interval until I reached my goal pace during the 8th interval. By the time I finished the 12th interval I was tired but not completely worn out. That gave me the confidence to do them all at goal pace a couple weeks later. To be honest though. all interval workouts except for 400s intimidate me! I wish I could just do 400s and nothing else! Oh, that's a great way to approach doing that many. I think I've done that many just once and it was nerve-wracking leading up to it and pretty intimidating even in it up until I got to repeat #8. Ah I've been scared for mile repeats as well! I think it'd be a great workout, but it seems intimidating. I don't think I'll do it before my marathon in October, but once that has passed, maybe I'll try doing it just for the challenge. My favorite interval distance is 400 for sure. I feel like I can really push that entire lap, so I am always happy with my time, but also don't feel like I suffer too much. That's awesome!! I've never done 1600s or 800s...they scare me, so kudos! Glad to see all that speedwork is paying off!